This is the view towards Dinding river (left side). From the map provided, the land has 2 sides adjoining the river. This is the view towards Dinding river (right side). When joined up with the above photograph, it presents a beautiful view of the river. 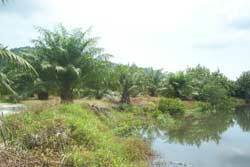 View of the oil palm trees lining the banks of the river. 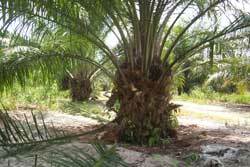 A closer look at the oil palm trees.